Welcome to the Ranch, Nolan. We already adore you. Yayyy!!! Congrats Auntie B!! Soo cute!!! Cutest name ever! 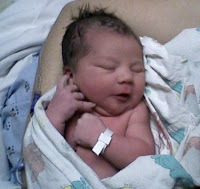 And btw that is a REALLY cute baby for being so brand new.